FBI Director, James Comey has been fired, in a statement, according to the White House. The director was in the FBI office in Los Angeles for field inspection and recruitment event to boost diversity, and was watching the TV when he saw about his removal from his position. According to officials at the scene of where Comey learned of his fate, the director was "surprised, really surprised" and was "caught flat-footed." Today, President Donald J. Trump informed FBI Director James Comey that he has been terminated and removed from office, President Trump acted based on the clear recommendations of both Deputy Attorney General Rod Rosenstein and Attorney General Jeff Sessions.. It is essential that we find new leadership for the FBI that restores public trust and confidence in its vital law enforcement mission. 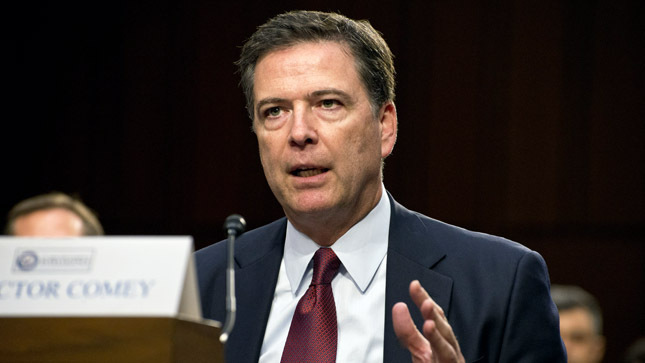 Comey while testifying in front of the House Committee on Intelligence on March 20, 2017 confirmed to that the bureau was investigating Russian interference in the U.S. election and "any links between individuals associated with the Trump campaign and the Russian government and whether there was any coordination between the campaign and Russia's efforts." It is essential that this Department of Justice clearly reaffirm its commitment to longstanding principles that ensure the integrity and fairness of federal investigations and prosecutions. The Director of the FBI must be someone who follows faithfully the rules and principles of the Department of Justice and who sets the right example for our law enforcement officials and others in the Department. FBI Director Comey was the best thing that ever happened to Hillary Clinton in that he gave her a free pass for many bad deeds! The phony Trump/Russia story was an excuse used by the Democrats as justification for losing the election. Perhaps Trump just ran a great campaign? it took guts" for Comey to announce that the FBI would be reviewing emails in the previously closed investigation into Clinton's private email server. Andrew McCabe is the current acting director of the FBI, he was the deputy to James Comey prior to his firing by Donald Trump.